L-R: Cathleen Shultz, Michelle Gray, Dean Linda McCauley, Laura Layne, and Carole Jakeway. 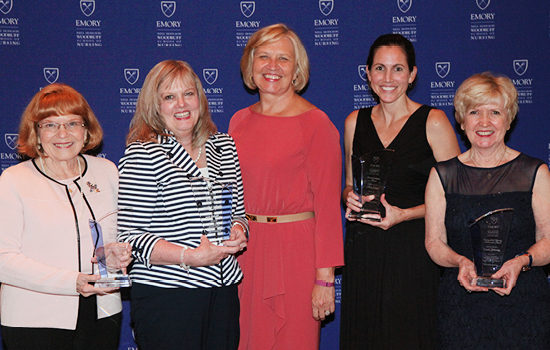 The Nurses’ Alumni Association (NAA) honored four outstanding nurses during Homecoming 2014. NAA awards recognize alumni and friends who embody the School of Nursing’s key values of scholarship, leadership, and social responsibility. Dr. Cathleen Shultz PhD 76MN served as founding dean of Carr College of Nursing at Harding University in Little Rock, Ark., for 34 years. Under her leadership, the college was the first nursing program in Arkansas to use computers as part of learning, introduce primary care into the curriculum, initiate health screenings in public schools, provide health information and services for the elderly, and incorporate health missions into the curriculum. She will return as a full-time professor after completing her sabbatical. As nursing director of the Critical Care Unit at Emory University Hospital, Michelle Gray 89MN is helping the hospital become a national leader in patient- and family-centered care delivery. She also leads the development of a Bedside Shift Report Bundle of safety components and new processes for nurses to report as they hand off patients during shift changes, all the while involving patients’ families in the process. Gray received the Beacon Award from the American Association of Critical-Care Nurses in 2010. Laura Layne 05N 06MN/06MPH coordinates primary and specialty care for more than 26,000 patients a year as director of health services for Good Samaritan Health Center in Atlanta. Layne also teaches as a clinical instructor for the nursing school’s Lillian Carter Center for Global Health & Social Responsibility’s Migrant Farmworker Family Health Program in Moultrie, Ga. She has collaborated with state and local partners to help plan and implement the program since 2006. Carole Jakeway MPH BSN RN NEA-BC oversees nursing and pharmacy programs for the Georgia Department of Public Health (GDPH) as director of district and county operations. Jakeway also leads the Good-to-Great initiative, designed to strengthen public health leadership throughout GDPH, and serves on the executive committee of the Georgia Nursing Leadership Coalition. Jakeway was chief nurse for the Georgia Division of Public Health under the Department of Community Health for 20 years. She is a former president of the Association of Public Health Nurses (APHN) and currently represents the Southeastern region on the APHN board of directors.